Prime beachfront location, infinity pool, stunning ocean views? Baan Dalah is a tropical home that gets all the right boxes ticked. Beautiful interiors, a full range of modern amenities and impeccable service rounds out an incredible holiday. Containing three bedrooms, Baan Dalah is ideally set up for accommodating small families or shared among groups of six. The master bedroom enjoys generously proportioned interiors and panoramic sea views. A terrace extends out from the room; it’s a great spot for taking in the spectacular sunrise and sunset shows. Indoors, there’s a plush king bed, plasma TV with DVD player and ample wardrobe space. The attached en suite is large and luxurious, with a spacious shower alcove and double vanity. Both guest bedrooms are located behind the master bedroom in a standalone pavilion. The rooms are identical in design and amenities, except for the bed configuration - the first room features a king bed while the second room is outfitted with twin singles. Guests enjoy access to a TV with DVD player and en suite with shower recess. Taking a dip or enjoying a swim at Baan Dalah is an unforgettable experience, thanks to the infinity pool set alongside the beachfront. 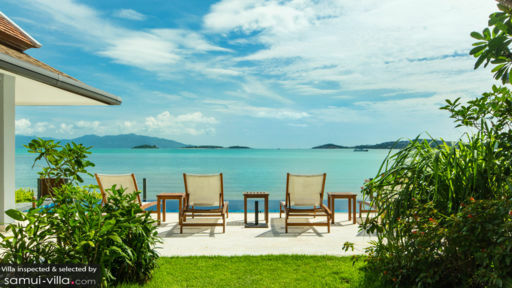 A row of recliners are plonked down by the pool, in a prime position that looks out to the ocean, inviting vacationers to relax and soak up the breezy Samui vibes. You’re only just steps away from the coast, so beach strolls, sunbathing upon the sand and dips in the ocean are activities that’ll make up a good part of your holiday. 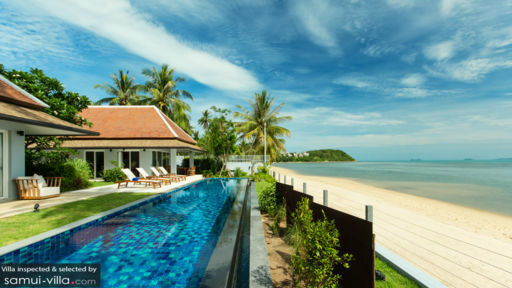 Thoughtfully designed to make the best out of its coastal surroundings, the living spaces of Baan Dalah are positioned such that you’ll enjoy uninterrupted sea vistas while lounging in. Step into the indoor lounge, and you’re greeted with the sight of the sparkling ocean and neighbouring islands, which reveals itself through floor-to-ceiling glass sliding doors. Plump sofas coloured in soft creams and striking reds fill up the area, and are centered around a plasma TV. The lounge extends out to include a dining area furnished with a wooden dining set and an open kitchen decked out in a monochromatic colour scheme and a full range of cooking amenities. Baan Dalah enjoys impeccable service. Airport pickup, daily breakfasts, and daily housekeeping are included with your stay. A baby cot is available at request, while vehicle rental, laundry, and massage services are available at additional cost. beach-lovers with its vibrant dining and nightlife scene. Fisherman’s Village, located five minutes’ drive away is a great venue for spending a relaxed evening. Upscale establishments are peppered around the hub, offering plentiful options for shopping and dining. There’s Alla Baia, Café De Pier X Samui and Il Salotto for beachfront dining. Karma Sutra offers a lively ambience, and is a good option for taking a nightcap before you head back to your villa. Your manager will readily assist with in-villa yoga or spa sessions. But if a yoga studio or spa parlour is your preferred venue, check out The Yogarden Samui (four minutes’ drive) and Six Senses Spa (14 minutes’ drive). Families looking to spend quality time together will enjoy discovering attractions like the Samui Cultural Centre (55 minutes’ drive), Secret Buddha Garden (about an hour’s drive) or Canopy Adventures (37 minutes’ drive).